Electric powered corrosion resistant cleanroom hoists feature push-button controls and are rated for H-4 operation or up to 30 minutes of use per hour. Manual and motorized trolleys permit hoist travel along monorails and bridge cranes. 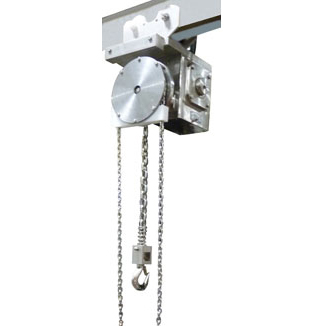 Our Stainless Steel chain electric hoist is perfect for cleanroom applications. Many Pharmaceutical and Food Processing companies have come to rely on The David Round Company for their material handling needs. We keep their product clean and allow trouble-free maintenance. 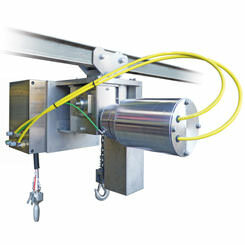 Manual Chain Hoists are also available. 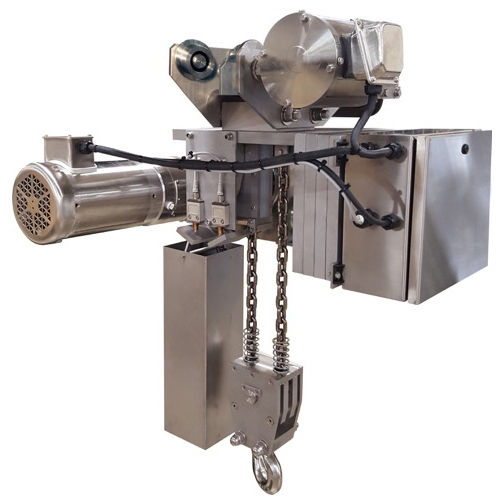 We also offer additional clean room lifting products including stainless steel hoist (wire rope) products, cleanroom strap hoists, and stainless steel wall mounted jib cranes. Need something to lift that load at the ground level? Check out our Ruger Lifts that are also available in stainless steel.